Bomb for road don kill at least seven people today, for one area outside Somalia capital wey be Mogadishu, according to army for di country. Most of di victims for dis attack na women farmers, and tori be say terrorists no wan hear di word of Somalis wey bin don enter street to protest all di kill-kill. Somalia still dey try recover from last weekend bombing wey kill at least 358 people, and till now, 56 people still dey miss. As almost all di victims wey die na country people. plenty Somalis vex, enter street dey protest against terrorism. 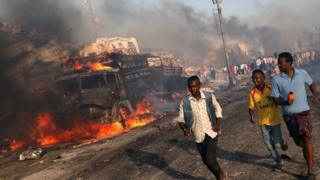 Dis latest attack hit one small bus for Daniga village wey dey about 40 km to northwest side of Mogadishu. "We hear big sound today and na so we run go di place; we see bus wey don destroy finish, and at least seven dead bodi, most of dem na women dem be. We no fit recognise some people, because na just pieces of human flesh we dey see," na wetin one farmer wey be Nur Abdullahi tell Reuters news agency with phone. Di area wey di bombing happen dey near areas wey terrorist group al-Shabaab dey control. Mr Abdullahi say: "we dey fear...hundreds of militants wey dey wear mask for face dey everywhere, and we feel say government go come attack here...today we o pack our cloth dem, begin pick race." One army officer say di number of those wey die fit rise as time dey go. "We know say di small bus comot from Afgooye dis morning and..di thing bin carry more than 10 people. We no fit get plenty tori because no be government dey control dis area," Captain Isa Osman wey dey work with di Somali National Army talk.